Stile Pot - So Why Bother? This article was originally published in CPC Record no. 92, October 2008, pages 26-27. Stile Pot is located on the far side of the depression between Bar Pot and the stile down to Trow Gill. It was first described in Northern Caves as being 4½ metres deep, but initial investigation showed that it had never been more than a couple of metres. Mike Wooding and I first looked at it in early 2005 when we were looking for likely exits to the passage found at the top of Small Mammal House in Bar Pot. At the time, it was cunningly disguised as a slightly over-sized rabbit hole. A little bit of effort was put into digging out the accumulated detritus, but attempts were abandoned when Small Mammal Pot was opened up. However, the draught emerging from the entrance preyed on our minds and a return was made a year later. A descending rift was widened by levering slabs off the wall, and, with Elaine Hill's help, a protuberance was removed from one wall. This allowed access to the top of a small choked shaft. By this stage, John Sellers had joined the fray. 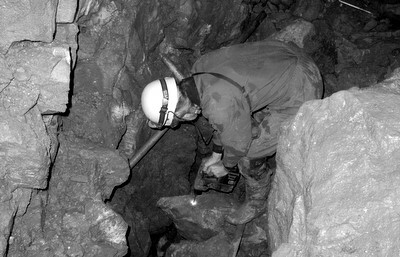 Following Mike's death in August 2006, John and I concentrated on emptying the shaft of sands and gravel. This was a slow process - the largest digging container that could be pulled through the entrance rift had a capacity of 4 litres, and aging backs couldn't take too much punishment. Fortunately, after a few trips we were reinforced by Dave Checkley and Phil Johnstone - which together formed a team of ex-LUSS wrinklies, reunited after some forty years. 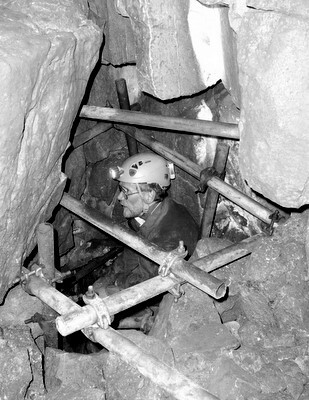 Eventually, after some 20 sessions, a 4.5 metre shaft had been emptied - one gallon at a time - and a passage exposed with a veritable gale blowing out through tightly packed boulders. Access to the passage was awkward, so Pete Jones and the CPC Digging Team provided some much appreciated help in vaporizing a slice of bedrock. The boulders were pulled back to the base of the shaft, smashed up with a sledgehammer, and hauled out. After about 4 metres a squeeze dropped into Rambling Syd Rumpo, a very loose, steeply descending rift. Unfortunately, it split into three at a depth of 18 metres, and the main route pinched in. This was capped under very cramped conditions until it was possible to wriggle through the Molestrangler - a tight, inclined slot. The landing was onto a large boulder in a small chamber developed in a shale bed - the same one as is found at the bottom of Small Mammal House. All around was hanging death, with a loose floor and a tottering back wall which divided the chamber into two. The draught, however, emerged strongly through the boulders in the floor, and a dig commenced beneath the large boulder - thereafter known as the Molecrusher. A scaffolded route was engineered and a cobble-filled passage reached. This was soon cleared out, and after four metres the passage dropped into a small chamber with a boulder-filled rift continuing ahead and a boulder roof above. Ged Benn's help was enlisted to try to stabilise the place, but it was obvious from the inspection of the consequential damage that there would be no safe way along the rift. It was the Bradford Winch Meet at the time, and as the damage was being surveyed, Jimmy Rattray's voice was heard above our heads. He was descending the pitch in Small Mammal Pot, and soon his light could be seen through the boulder roof, which creaked ominously as he trampled over the top of it. Having given up on the prospects ahead, an interesting few sessions were had constructing a route up through the boulder floor into Small Mammal House. Life wasn't helped by a six-ton boulder which became progressively more overhanging as we removed its support, and once again we had to enlist Ged's help to knock it down to size. The current route isn't exactly safe as houses, but provided one keeps to the scaffolding and don't look at the boulders too carefully, it's safe enough. We're now looking for a new project. Has anyone seen a shakehole that doesn't have Rob Scott's name on it?